Many of you have seen the commercials for Dr. Scholl’s computerized scanner that evaluates your foot and tells you what insert you should be buying for your shoes. Or you may have heard others say “you have to wear good shoes with arch supports”. Is this true? In my recent blog for the periodical Podiatry Today, I discuss many of the studies which are inconclusive with respect to the real benefit of using an orthotic. In other words, placing these devices in your shoes to overcome and injury is nothing more then a shotgun approach to solving the problem. It may work or it may not. I encourage you to read my blog post which I have also pasted below. Thanks! Feel free to ask questions. Our profession needs to keep an open mind in regard to shoes and treating running injuries. People do not change what they are doing unless they have a reason to change. I continue to see runners not responding to orthotics and stability control shoes in my practice so I have provided a change, one that is working for others and myself. 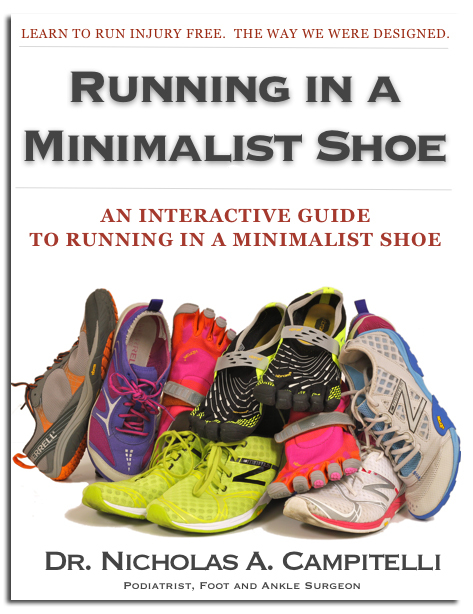 Of course, there is not a preponderance of evidence to support this change but there are emerging studies that support my thinking regarding the use of minimalist shoes. I have cited these studies in the past and will continue to do so. If the prior literature on orthotics were conclusive about their effectiveness, I would not be so strong-minded in my approach. I still feel there is a lack of clarity and consensus in the literature to support the use of orthotics. Can orthotics work? Absolutely. How and what exactly do they do? It is very difficult to prove given the variability of one’s form, training pattern, shoe gear, strike pattern, biomechanics, body weight, training intensity and change in surfaces. My stance is that orthotics can treat an injury but this is a very haphazard approach. I think they are a crutch for treating the underlying problem, which may be overuse, poor form, weak musculature or improper training patterns. I use orthotics in my practice, albeit rarely. I have found that by spending more time educating my patients on proper training patterns, form, foot strike, surface consistency, strengthening and shoe gear, I can make more of a difference in improving their injury. It can be more time consuming and challenging, but very gratifying. I do not encourage patients to discontinue using an orthotic if it is working for them. Again, I find this is very rare in my practice as most of the patients I see have already failed this type of therapy. The same applies to traditional running shoes. Many of the runners I train with wear traditional running shoes (yes, even ASICS) and I do not persuade them otherwise if it is working for them. I love running, podiatry and making a different in people’s lives. I am trying to change the way we think of feet in our society. We live in a society that has the stigma that we need to support and cushion our feet, which has yet to be proven. Shoes have evolved with no basis of evidence as to why a raised heel is present among many other features. I encourage others to be open-minded and consider my approach. I certainly have leaned more about orthotics and minimalist shoes as a result of being challenged by my colleagues. 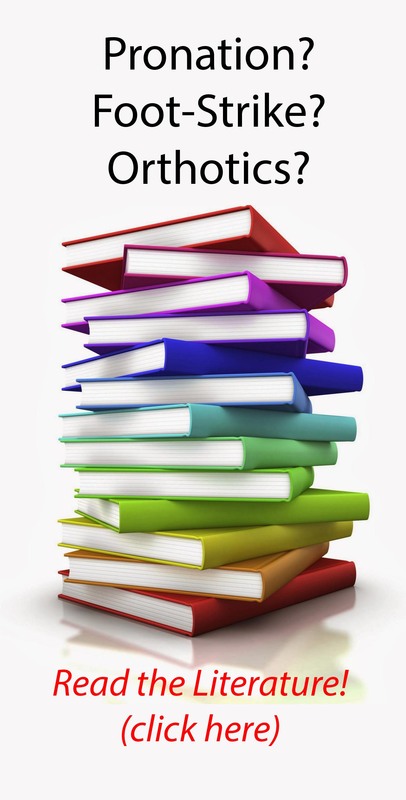 Thank you for stimulating my interest and encouraging me to read more. In regard to providing references to reinforce my opinions, I have done so in the past. Remember, I am speaking in regard to a paradigm change. We only have so much published on the new treatment and approach to running injuries as well as everyday foot pain and leg pain. Gross and coworkers looked at 15 people with plantar fasciitis and found they could walk 100 meters with less pain by wearing an orthotic.9 This was not a long-term follow-up and in fact, the longest amount of time of wearing the device before testing was only 17 days. The study authors conclude that “custom semi-rigid foot orthotics may significantly reduce pain” during walking but these results were also subjective as they were based on patients rating their pain with the visual analogue scale and completing a questionnaire. Shih and colleagues looked at 24 runners with a pronated foot and knee pain who experienced pain relief with a medial wedge orthotic while running on a treadmill for 60 minutes.12 The follow-up was at two weeks so it difficult to draw any long-term conclusions from this study. In a cohort-controlled trial, Ferrari examined the efficacy of orthotics in the treatment of trochanteric bursitis.13 He noted a 90 percent improvement in patients who received orthotics and a corticosteroid injection to the trochanteric bursa with fluoroscopic guidance in comparison to a 40 percent improvement in patients who had the injection only over a four-month period. Essentially, this study suggested that the placement of a rigid device in a shoe may facilitate pain relief for those with hip pain. How? In a 2011 randomized, controlled trial involving 400 military trainees, Franklyn-Miller and colleagues demonstrated a 10-time reduction in medial tibial stress syndrome and a 7-time reduction in chronic exertional compartment syndrome with the use of orthoses.14 Overall, the authors noted an absolute risk reduction of 0.49 with the use of orthoses. However, it was not clear from the study how the orthoses were preventing injury and what the devices were doing from a clinical standpoint. In another randomized, controlled trial involving 179 patients, Collins and coworkers examined the use of orthoses and physiotherapy for people with patellofemoral pain syndrome.16 While patients perceived foot orthoses as being superior to flat inserts, the researchers found no significant difference in combining orthoses with physiotherapy. In other words, adding orthotics to the physical therapy already prescribed produced no further improvements. This study demonstrated that active therapy can improve patellofemoral pain without relying on a permanent orthotic device. In 2011, Mills and coworkers examined the short-term efficacy of orthoses in patients with anterior knee pain.17 This was a extremely short-term study of six weeks involving 40 patients with patients subjectively classifying an improvement in symptoms with prefabricated orthotics in comparison to no treatment at all. The studies I discussed above are not selective representation of articles to support my opinions. My opinions are based on some of the articles and research provided by Kevin Kirby, DPM, in response to my last blog (see http://www.podiatrytoday.com/blogged/can-minimalist-shoes-be-beneficial-… ) as well as the research and literature I have read and continue to read. In summary, my opinions on the use of orthotics for treating runners are based on the lack of definitive evidence as to their exact role. This leads me to be open-minded in my approach to treating running injuries. There is an enormous amount of variance in factors that can contribute to running injuries and the aforementioned studies seem to raise more questions than they answer on orthotic intervention. For example, to rely on symptoms of greater trochanteric bursitis improving after wearing a shoe orthotic does not render any evidence as to why. Of course, we can see gait changes by using an orthotic but we can also see gait changes in runners by implementing a more natural style of running which involves landing at or near below the center of gravity of the body on the midfoot. Striking in this manner all but negates the need for any orthotic because there is minimal concern on controlling rearfoot motion. I have yet to see any study comparing orthotics to using a midfoot or forefoot strike pattern along with improved running form for treating injuries. We need to collectively move forward with progressive thinking and challenge new and old theories. My opinions are based on current and past literature, and are not biased in regards to any shoe company, specifically Vibram USA. In regard to my alleged ulterior motive to market FiveFingers shoes (Vibram USA), they are and continue to be a training tool for me in running. Having the opportunity to sample running shoes, I tend to train and run in a lot of different types of shoes. I recently ran a marathon in a pair of New Balance RC5000s. However, to be clear, I have no financial interest in any of the shoe companies. It is very disheartening to see my colleagues belittle my attempts at progressive treatment options that are in current use to treat runners. We can see that as a result of the popularity of minimalist shoes as well as the lowering in heel height of traditional running shoes, a change has occurred in the running shoe industry. In my clinical experience, those involved in the sport of running are now beginning to focus more on form than on footwear itself. This is changing the way we all run and will soon change podiatry for the positive. 1. Richter RR, Austin TM, Reinking MF. Foot orthoses in lower limb overuse conditions: a systematic review and meta-analysis–critical appraisal and commentary. J Athl Train. 2011;46(1):103-6. 2. Gélis A, Coudeyre E, Hudry C, Pelissier J, Revel M, Rannou F. Is there an evidence-based efficacy for the use of foot orthotics in knee and hip osteoarthritis? Elaboration of French clinical practice guidelines. Joint Bone Spine. 2008;75(6):714-20. 3. McPoil T, Cornwall MW. Relationship between neutral subtalar joint position and pattern of rearfoot motion during walking. Foot Ankle Int. 1994;15(3):141-5. 4. McPoil TG, Hunt GC. Evaluation and management of foot and ankle disorders: present problems and future directions. J Orthop Sports Phys Ther. 1995;21(6):381-8. 5. Jarvis HL, Nester CJ, Jones RK, Williams A, Bowden PD. Inter-assessor reliability of practice based biomechanical assessment of the foot and ankle. J Foot Ankle Res. 2012 Jun 20;5:14. 6. Donatelli R, Hurlburt C, Conaway D, St. Pierre R. Biomechanical foot orthotics: A retrospective study. J Ortho Sp Phys Ther, 1988; 10(6):205-212. 7. Moraros J, Hodge W. Orthotic survey: Preliminary results. J Am Podiatr Med Assoc. 1993; 83(3):139-148. 8. Walter JH, Ng G, Stoitz JJ. A patient satisfaction survey on prescription custom-molded foot orthoses. JAPMA. 2004;94:363-367. 9. Gross MT, Byers JM, Krafft JL, et al. The impact of custom semi-rigid foot orthotics on pain and disability for individuals with plantar fasciitis. J Ortho Sports Phys Ther. 2002; 32(4):149-157. 10. Saxena A, Haddad J. The effect of foot orthoses on patellofemoral pain syndrome. J Am Podiatr Med Assoc. 2003; 9(4):264-271. 11. Kilmartin TE, Wallace WA. The scientific basis for the use of biomechanical foot orthoses in the treatment of lower limb sports injuries-a review of the literature. Br J Sports Med. 1994; 28(3):180-184. 12. Shih YF, Wen YK, Chen WY. Application of wedged foot orthosis effectively reduces pain in runners with pronated foot: A randomized clinical study. Clin Rehab. 2011; 25(10):913-923, 2011. 13. Ferrari R. A cohort-controlled trial of customized foot orthotics in trochanteric bursitis. J Prosth Orthotics, 2012;24(3):107-110. 14. Franklyn-Miller A, Wilson C, Bilzon J, McCrory P. Foot orthoses in the prevention of injury in initial military training. A randomized controlled trial. Am J Sports Med. 2011; 39:30-37. 15. Mattila VM, Sillanpää PJ, Salo T, Laine HJ, Mäenpää H, Pihlajamäki H. Can orthotic insoles prevent lower limb overuse injuries? A randomized-controlled trial of 228 subjects. Scand J Med Sci Sports. 2011 Dec;21(6):804-8. 16. Collins N, Crossley K et al. Foot orthoses and physiotherapy in the treatment of patellofemoral pain syndrome: randomised clinical trial. Br J Sports Med. 2009; 43:169-171. 17. Mills K et al. A randomised control trial of short term efficacy of in-shoe foot orthoses compared with a wait and see policy for anterior knee pain and the role of foot mobility. Br J Sports Med. 2011;46:247-252. 18. Finestone A, Giladi M, Elad H, et al. Prevention of stress fractures using custom biomechanical shoe orthoses. Clin Orth Rel Research. 1999;360:182-190. 20. Tuan K, Wu S, Sennett B. 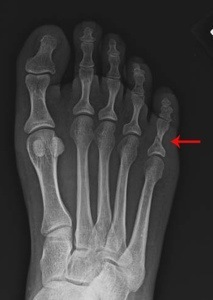 Stress fractures in athletes: risk factors, diagnosis, and management. Orthopedics. 2004;27(6):583-91, quiz 592-3. 21. Edwards WB, Taylor D, Rudolphi TJ, Gillette JC, Derrick TR. Effects of stride length and running mileage on a probalistic stress fracture model. Med Sci Sports Exerc. 2009;41(12):2177-84.